Oracle (ORCL), one of the latest additions to my portfolio is down 8.32% since I bought it. On June 20th when the stock was going down after Oracle announced that it missed reaching sales expectations for its fiscal fourth quarter, I refused to sell because I still believe strongly in the fundamentals of this company. The company reported 80 cents per share on revenue of $10.95 billion. Even though expectations for fiscal Q4 were not met, their fundamentals are unchanged and the stock is still very attractive to me. At the same time missed sales expectations were announced, some positive updates happened as well. The company doubled its dividend to 12 cents and announced new strategic partnerships, one of them with Microsoft, a longtime rival and direct competitor of Oracle. To put things in perspective, in the same quarter one year ago, Oracle Corporation (ORCL) reported earnings of 69 cents per share on $10.9 billion in sales. If you read the sentence above well, you will realize that earnings per share year over year increased 13.75% (from 69 cents to 80 cents). Revenues also went up as well year over year, from $10.9 billion to 10.95 billion. Not as much as the $11.12 billion that analysts were expecting, but the company still demonstrated that it is moving forward during some the most challenging economic conditions that the world has faced in a very long time. The company’s full-year revenue was reported to be $37.18 billion, and its earnings per share were $2.68 for the full year. Consensus estimates for Oracle’s full-year numbers were at $37.45 billion in revenue and $2.68 in earnings per share. In other words, yes it was a bad quarter, but the consensus estimate of earning per share for 2013 are still on track. This is a typical market overreaction, and creates a great opportunity to grab some more shares at even more attractive prices. Nothing I shared in my earlier analysis of Oracle has changed this quarter. Oracle’s HCM Cloud, CRM Cloud and ERP Cloud grew 50% as they added over 500 new SaaS customers in Q4 alone. Additionally, Oracle larger than SAP and Workday combined. The board also authorized Oracle to buy back up to $12 billion worth of common stock under the company’s existing share repurchasing program. Something that Oracle has been doing intensively since 2011. This continues to be one of the things I really like the most about this company and its stock. It is a clear commitment from executives to shareholders, and it show that they also believe share are currently undervalued. 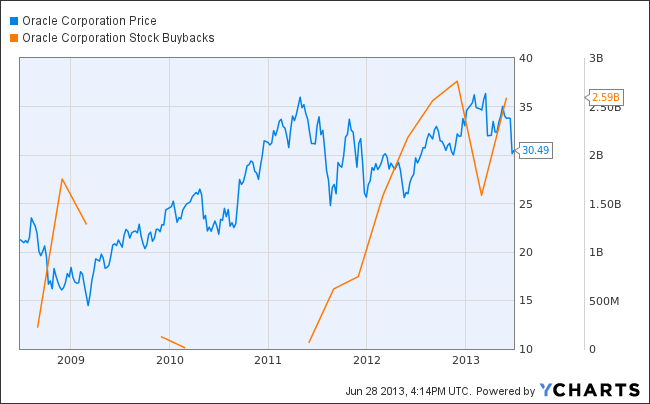 Oracle has never purchased so much of its own stock in its history. From 6/1/1999 to 5/31/2011, Oracle paid $32.10 billion (22% of its current equity market value) to repurchase 1,931.9 million shares at $16.62 apiece. According buyback monitor, this repurchased program ranks #8 for profitability among the 252 companies they studied back in 2011. The partnership with Microsoft (MSFT) is a major evolution in cloud computing, sending both customers and profits to Microsoft and Oracle. In this partnership, customers can run Oracle software on Windows Azure platforms as well as on the Microsoft (MSFT) Server Hyper-V. Oracle Database, Oracle Java, Oracle WebLogic Service, and Oracle Linux will now also be available to Windows Azure customers. This essentially takes all of the innovation that each company has managed to generate, and put it into one exciting package – making the product very attractive to customers, and greatly strengthening Oracle’s market share and future adoption. This alliance is clearly a response to Amazon (AMZN) and IBM, who somehow have managed to take the lead in cloud computing. With this move, ORCL shows its commitment to the future, and in my opinion, they have chosen the best partner to do the job. At this stage, the valuation multiple still looks pretty reasonable. For fiscal 2014, analyst are expecting earnings of $2.92 a share, up 9 percent from last year, which implies a P/E multiple of 10 times. The last quarter marked the second consecutive quarter of 5 percent non-GAAP EPS growth, but Oracle is arguing that this growth rate can be accelerated based on a recovery in hardware product revenues in fiscal 2014, some further margin improvement, and an increase in buy-back activity. Oracle is definitely moving in the right direction, and this is a position I’m expecting to hold long term. Is Expedia spending too fast, too much?